Tampa students stand against attacks on trans rights | Fight Back! Tampa, FL – More than 50 Tampa area students and community activists gathered at the University of South Florida’s MLK Plaza, October 24, for a rally against Trump’s attacks on transgender rights. 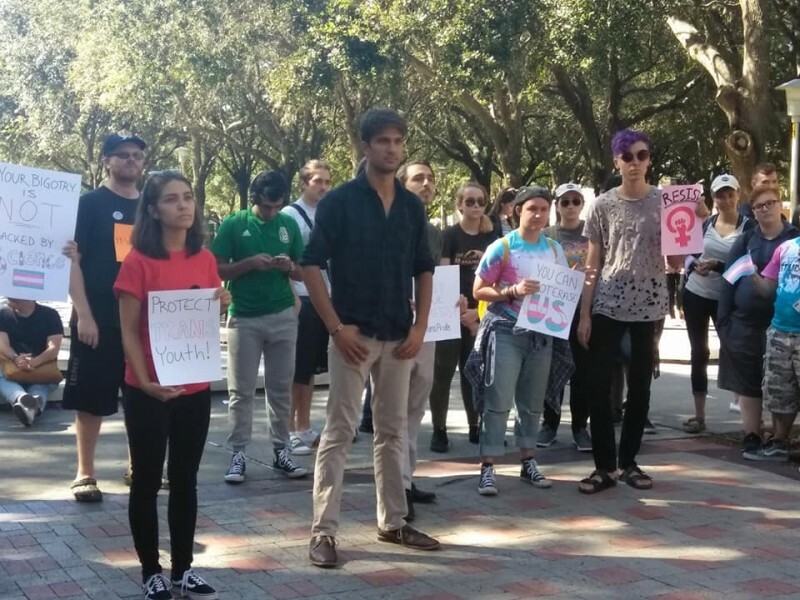 The protest was organized by Tampa Bay Students for a Democratic Society (SDS). Earlier this week it was announced that Trump administration officials were moving to alter Title IX rules to exclude trans people from basic services and protection from discrimination. This is only the latest attack on the LGBTQ+ community from the Trump administration. “We need to organize against Trump’s attacks on trans rights. The government needs to know that we will stand up and stand together against what they try to force on us, and we won’t take no for an answer,” said Taylor Cook, an organizer from Tampa Bay Students for a Democratic Society, underscoring the need for a militant response. The protest was located in a central area of campus with hundreds of students walking by. The protesters chanted, “When trans people are under attack, what do we do? Stand up, fight back!” and “It’s our history don’t deny it, Stonewall was a trans riot!” drowning out heckling from bigoted students nearby. The protest showed that the way forward for activists resisting Trump’s attacks on trans people is through mass protests and action. The event was part of Students for a Democratic Society’s national week of action in defense of trans rights.